Former Premier Rob Borbidge delivers an address. Photo credit: Hayden Wieland. 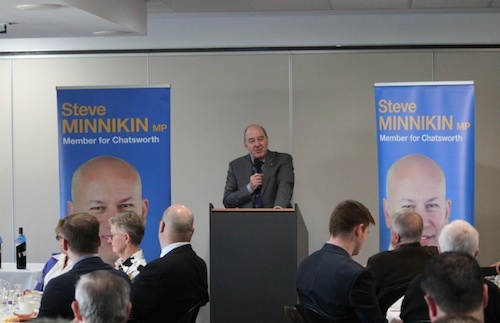 Local business owners were joined by Steve Minnikin (State Member for Chatsworth), Matt McEachan (State Member for Redlands) and a former Queensland premier for the LNP Chatsworth Business Breakfast at the Pacific Golf Club in Carindale on Wednesday morning. “The quarterly business breakfast is a good way to keep in contact with the business community, both locally but also from greater South East Queensland,” said Steve Minnikin. Guest speaker Rob Borbidge entertained the crowd with anecdotes and insights into running a minority government, a similar predicament faced by the current Palaszczuk administration. Following his speech, the former Premier held a Q&A session, where he answered questions on subjects such as the Uber and taxi regulation issue, the duplication of departments at multiple levels of government and several strengths and weaknesses of the state government led by Campbell Newman. 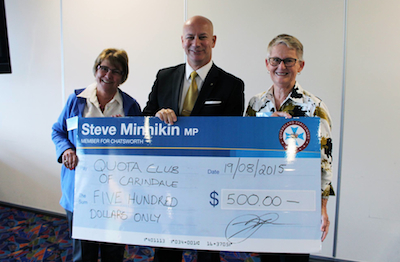 Steve Minnikin presents a cheque to the Quota Club of Carindale. Photo credit: Hayden Wieland. Proceeds from the breakfast totalling $500 were presented to the Quota Club of Carindale, a local organisation which assists charities such as CleftPALS Queensland and the Aspergers Syndrome support group. The Quota Club of Carindale team’s 11 members have been working in the local community for 28 years, also drumming up support for the towns of Condamine and St George following the widespread destruction caused by ex-Tropical Cyclone Oswald in 2013. Bryce is a lifelong Carindale resident and a QUT Journalism & Law student writing for Carindale Connect. Bryce loves sport! He played Australian football for the Carindale Cougars in primary school and for five years also worked as an umpire there. He has played for the Coorparoo Juniors and is now playing for the senior club, the Coorparoo Kings.